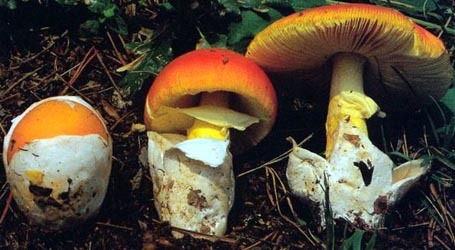 english name "Jenkins' Pink-Gilled Amanita"
The following description is based on Jenkins (1985). The cap of A. roseophylla is 20 - 40 mm wide, convex to plano-convex, golden-blonde in the center, lightly to near putty on margin, glabrous, with a slightly striate, slightly incurved margin. The volval remnants are thin, very sparse, pale grayish, relatively delicate, and usually disappearing with age. The cap skin is easily separable from flesh. The flesh is white, 1 - 3 mm thick over stem, unusually thickened at cap margin. The gills are pinkish-white, moderately close, narrow, remote from stem, with floccose edges. The short gills are moderately abundant and truncate. The stem is up to 50 × 7 - 8 mm, cylindric, mostly smooth, white to pale cream, stuffed to hollow. Volval remnants often absent, but if present they are slightly floccose, pale grayish patches. The ring is whitish, narrow, striate above, floccose below, delicate, disappearing with age. The basal bulb is subabrupt, egg-shaped, with narrow end pointing down, up to 20 × 17 mm. The flesh is white. The mushroom has no odor or taste. The spores measure 10.2 - 11.7 × 7.0 - 7.8 µm and are ellipsoid and inamyloid. Clamps are present at bases of basidia. Originally described from Alabama, USA where it occurred under loblolly pine (Pinus taeda) and mixed hardwoods. It is still only known from the type locality in Talladega. author Dav. T. Jenkins. 1985. Mycotaxon 24: 283 - 286 fig. 1. The following description is based entirely on the protolog. pileus 20 - 40 mm diam, convex to plano-convex; golden-blonde on disc, lighter to near putty on margin; context white, 1 - 3 mm thick at center, tapering toward margin; margin very slightly striate, usually slightly incurved; universal veil very sparse, as thin, floccose patches, pale grayish, randomly distributed, relatively delicate, usually disappearing with age. lamellae pinkish white, moderately close, narrow, widely free, edges floccose from remnants of partial veil; lamellulae moderately abundant, truncate. stipe up to 50 × 7 - 8 mm, cylindric, mostly glabrous, white to pale cream; partial veil; context stuffed to hollow, white; bulb ovoid, submarginate to marginate, up to 20 × 17 mm; universal veil few or absent, or if present, as slightly floccose-membranous, striate above, floccose below, delicate, disappearing with age. odor/taste Odor not distinct. Taste not distinct. basidiospores [-/-/-] 10.2 - 11.7 × 7.0 - 7.8 µm, (Q = 131 - 1.56; Q’ = 1.49), ellipsoid, adaxially flattened, thin-walled, hyaline, inamyloid; apiculus sublateral, cylindric; contents guttulate; white in deposit. ecology Solitary to gregarious. Alabama: Under loblolly pine and mixed hardwoods. material examined U.S.A.: ALABAMA—Talladega Co. - Talladega, Lay Lake, prop. Dr. John Farmer, 18.ix.1983 Dav. T. Jenkins 1755 (paratype, in herb. Dav. T. Jenkins, Univ. Alabama, Birmingham), 15.ix.1984 Jenkins 2594 (holotype, in herb. Dav. T. Jenkins, Univ. Alabama, Birmingham), 16.ix.1984 Dav. T. Jenkins 2595 (paratype, in herb. Dav. T. Jenkins, Univ. Alabama, Birmingham). select a collection to review/add spore measurements..#783715. Dav. T. Jenkins, #1755, U.S.A., ALABAMA, Talladega Co., Talladega, Lay ..#783716. Jenkins, #2594, U.S.A., ALABAMA, Talladega Co., Talladega, Lay Lake, p..#783717. Dav. T. Jenkins, #2595, U.S.A., ALABAMA, Talladega Co., Talladega, Lay ..